Before we start, here is the link: boot.iso. Click on it, then save it to your hard disk. By the time you finish reading this review the ISO image will have downloaded. It will only take a couple of minutes to burn the 16MB image onto a bootable CD, which upon boot, provides easy, logical and well-structured instructions. 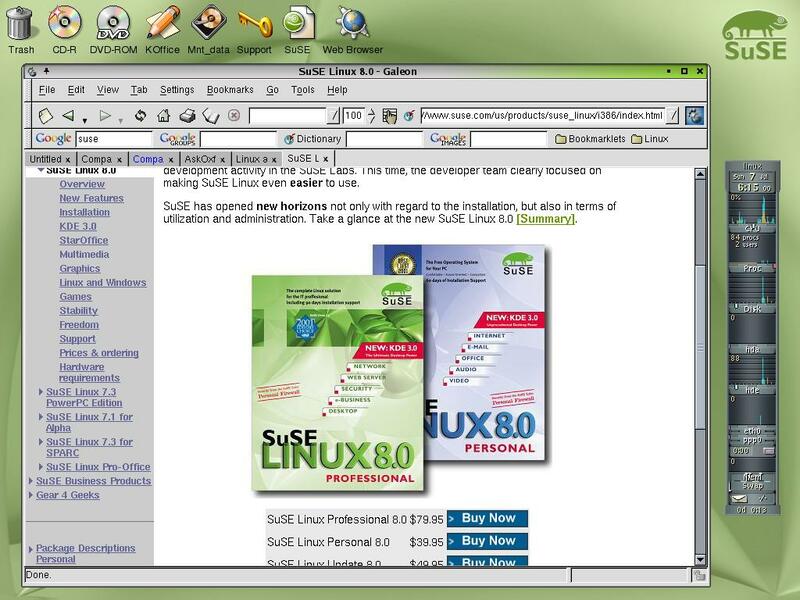 Several hours later, you will be greeted with a beautiful screen running on top of one of the most popular Linux distributions - SuSE Linux 8.0. 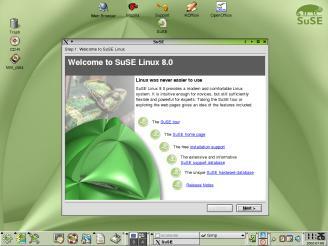 SuSE is an excellent Linux distribution occasionally suffering from image problems and bad press. The pendulum seems to swing rapidly - from major awards and recognition to highly critical eyes of reviewers, from solid earnings to the brink of financial collapses. Yet, SuSE is still around, enjoying the good times and somehow overcoming the rough ones. It's a warrior and survivor. SuSE is sometimes criticised by the media and the Linux community for four different reasons. The first one is a thorny issue of not providing freely downloadable ISO images of their products. The second is the marketing ploy of shipping two editions of boxed sets, of which the cheaper Personal edition lacks so many vital applications that it is impossible to recommend it -- unless you are buying it for the grandma. None of SuSE's main competitors, such as Red Hat or Mandrake have ever resorted to such lowly money-spinning tactics. Unavailability of open beta testing is another sore point and yet another area where SuSE differs from the rest. Then there is that subtle arrogance of a corporation's marketing department - quickly embracing any praise that comes SuSE's way while flatly refusing to accept any criticism as valid. This is a major difference between SuSE and Mandrake; try to offer a critical look at an aspect of the Mandrake distribution and they will react quickly, publish the story and open up for suggestions and improvements by their users. Not so at SuSE. SuSE does not provide downloadable and easy-to-install ISO images of their products as a matter of company policy. The SuSE Linux from Internet web page explains the reasons in some detail and don't even think about asking about this subject on the SuSE mailing lists -- unless you want to bring out the worst in some members of the community. I am not getting into a discussion about the moral issues of getting the free download without giving anything back; I believe that it is up to each individual to face the dilemma. Some preparation is needed in those cases where you won't have an access to another Internet-connected computer during the installation. First get to the SuSE mirrors page and choose one that is nearest you. Click on it to make sure it's active and that it contains the SuSE 8.0 directory. You will need to write down the exact path, for example: ftp://ftp.suselinux.hu/pub/suse/i386/8.0/. You will also need to find out the IP address of this mirror. This you can do from either a Windows or a Linux machine by typing "ping ftp.suselinux.hu" on the command line. The command will give you the IP information -- in case of ftp.suselinux.hu, the IP address is 195.38.96.124. Write it down. Now you are ready to start the installation. Insert the SuSE boot CD and reboot your computer. You will be presented with what looks like a standard SuSE boot menu, except that there are some extra options for more advanced installation settings. Simply select the appropriate screen resolution by pressing one of the corresponding F-keys, then press Enter to proceed. If you don't make any decisions here, the installation process will begin automatically in about 10 seconds with the default settings and the screen resolution of 800x600. It is worth noting that a text mode installation option is also provided. Next you will have the pleasure of meeting with a warning dialog box in strong red colour, which is SuSE's way of saying that something has gone terribly wrong. Don't panic -- everything is still exactly as it should be. The reason for the red warning is that the system could not find the full SuSE installation CD and, after dismissing the warning, the installation will continue. Now is the time to select your installation language and keyboard (many European languages are supported) before you will finally get to the "Main Menu". This is about the only place where you need to do some extra work, notably loading your network card modules. Select the "Kernel modules (hardware drivers)" item from the menu, then "Load network card modules" from the next menu. You will be very unlucky if yours is not one of the many items listed. Once your network module is loaded, press the back button to return to the main menu. You've probably learnt the SuSE menu drill by now, so we can go a bit faster. Select "Start installation/update", "Network" and "FTP". The next decision you need to make is the type of network you are on - basically you can either be on a network with a DHCP server (in which case you have a dynamically configured IP address) or you are on a network with a manually assigned IP address. Unfortunately, if you are using an ADSL service with a PPPoE type of connection, you are out of luck here as the installation does not provide for dialling your ISP. My solution to the problem was to buy a broadband router with a built-in DHCP server - this US$80 D-Link router is a gem, even if you aren't on a network, because you'll never need to dial your ADSL connection again! But let's get back to the installation. With the broadband router configured and active, I went with the DHCP option. The next task is to provide the IP address, followed by the correct directory, of the mirror site which you will be using as the system installation source. If you have been taking notes, you know what to type, but here is an example anyway: based on my earlier selection, the IP would be 195.38.96.124 and the directory would be /pub/suse/i386/8.0. After completing the above steps, the installation will return to its normal setup routine. This is provided courtesy of YaST, which SuSE has been perfecting for quite a few years and which has an easy-to-follow and logical structure. It is worth noting that, at this stage, the installation routine is equivalent to installing the SuSE Professional edition, except for the length of installation time. Depending on your Internet connection, the upload speed of your chosen mirror, number of packages selected and, to a certain degree, on the speed of your processor, the installation is likely to last several hours. Since the package installation stage is automated, the best way to go about this part of the process is to leave it for the night. Just a few more steps before you retire. YaST2 starts with another language selection screen which now includes Japanese and a few other languages as well. A routine hardware detection and an install-or-upgrade decision follows, after which you will see an HTML-style layout of some of the most important settings (see the screenshot below). Before clicking on the 'Accept' button, spend some time configuring your boot loader, time zone and most importantly, do the necessary partitioning. The partitioning tool is impressive -- it allows for re-sizing of Windows (FAT) partitions and provides comprehensive help in a sidebar. There are many advanced options too (such as LVM and RAID) and you can even import the partition table from an existing /etc/fstab file, which is something I haven't seen before), but if you are at that stage of your Linux learning curve, it is unlikely that you would need further instructions. And this is it. As soon as you hit the "Accept" button, a bright green warning screen will ask you to confirm that you do indeed want to proceed with the installation. Say yes, wait a few minutes to make sure that everything is exactly as it should be and simply forget about it for a few hours. The installation will have completed by the time you wake up in the morning. Congratulations! You have successfully installed SuSE 8.0 Download edition. This story has concentrated on the installation process of SuSE's download (or FTP) edition. But installation itself is just a small part of the user experience, albeit an important one. So how does SuSE fare in usability, features and other departments? Is it possible for an average Windows user to abandon their current OS and never look back again? First, let me point out things I liked about this SuSE release. Trouble-free installation. My experience with the installation process was very positive. In fact, I didn't encounter a single bottleneck or any illogical place and the installation was as smooth and trouble-free as it gets. This is one major advantage of going with a highly experienced Linux distributor; YaST has been in development for so long, it has been near-perfected. Great looks. As they say, you'll never get a second chance to make the first impression. After booting your freshly installed SuSE 8.0 for the first time, you will be greeted with a very pleasant desktop environment, all beautifully designed and logically structured. Even if you don't like green, you will have to admit that SuSE's graphics designers have put a lot of effort into making that desktop look stunning. YaST. 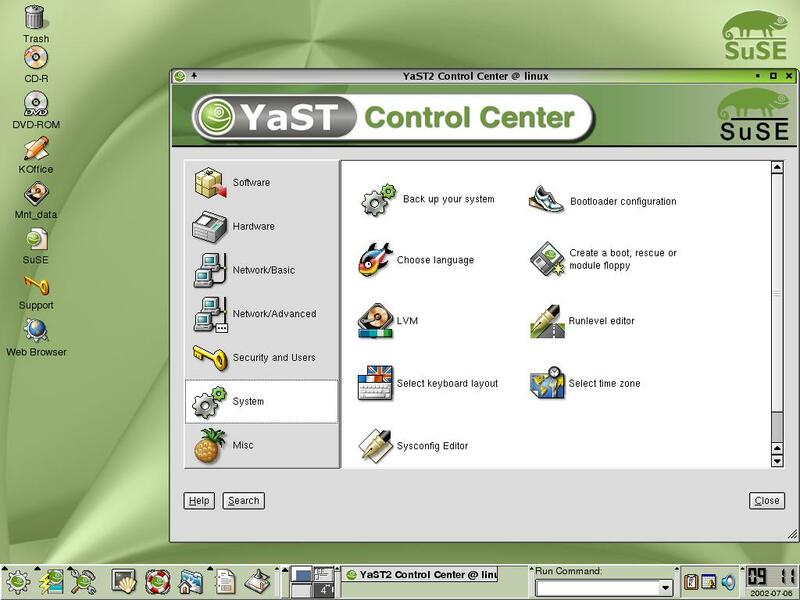 The YaST configuration tool has been given harsh treatment in some circles, alleging that any manually configured options will be overwritten next time you use YaST. This is hardly a YaST-specific problem. Most graphical configuration tools are designed this way and you will have to make up your mind beforehand whether or not to use it. Personally, I've found YaST to be a brilliant tool. Most common configuration tasks can be easily set up in simple dialogs, which should make any new user feel right at home. After all, it is in SuSE's interest to keep new users by providing graphical tools, rather than asking them to navigate thousands of UNIX-like config files in VIM, right? Online updates. 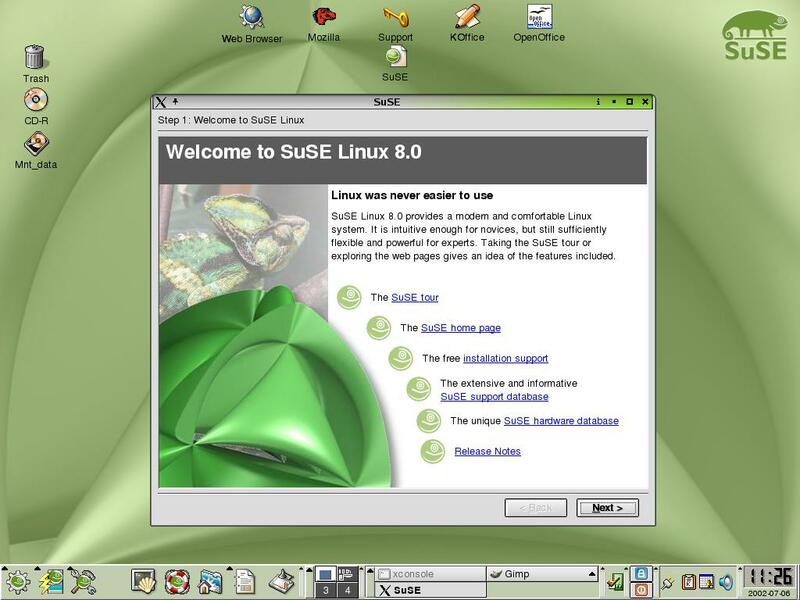 Most distributions nowadays provide easy graphical tools for post-release software updates, so SuSE's effort in this area is not unique. Nevertheless, I was pleased to see that the update selection included KDE 3.0.1 as well as the usual array of security patches. SuSE Help Center. What a great idea! SuSE has combined all the HOWTOs, FAQs, INFOs, READMEs, man pages, RPM package information and even some popular books such as Grokking the Gimp into a centralised, browseable and searchable database. Definitely something I would like to see adopted by other distributions if they are serious about attracting new users. Surely, nobody is perfect, so is there anything that could have been done better? Yes, of course there is. Online updates. This has been mentioned in the pros section, so why its appearance here? Well, once you browse the software packages, you will notice that many of them are slightly out of date. The new 1.0 releases of OpenOffice and Mozilla have not been added so if you want the latest, you will have to by-pass YaST and do a manual download/install. This is not a problem for many users as the previous versions are very usable, but I thought I should mentioned it for those of you who like to keep up with the latest development. Download in progress pop-up. Small thing, but extremely annoying -- during the download of packages and their dependencies, this little pop-up will appear on the screen and steel focus with every new package. Why can't this be done in the background!? Do I really need to be informed that a new download has started? 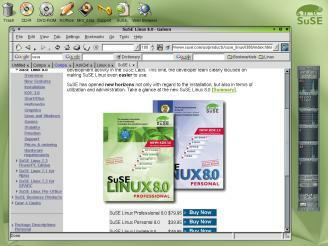 SuSE Linux 8.0 is an awesome distribution. The installation, hardware detection and initial system configuration was flawless. SuSE has been working hard on creating a visually pleasing working environment, easy-to-follow and logical configuration tools and a comprehensive help system. A few annoyances I have encountered were minor and do not diminish the very positive overall experience. I would not hesitate to recommend SuSE 8.0 to Windows users as a complete and adequate, if not superior operating system replacement for their desktops. "Software und System Entwicklung" or Software and System Development.